The important legacy of Truganini in Aboriginal history is without question. 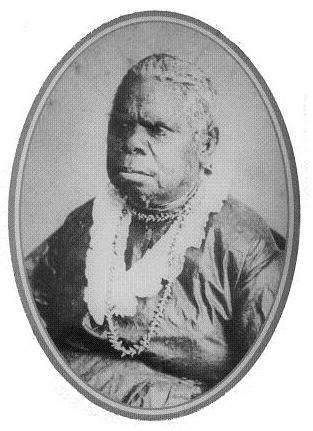 Born around 1822 in Bruny Island, she was the daughter of a tribal elder. By the time she was a teenager, she was no stranger to violent acts committed against her people. Tragically, her mother and fiance were murdered, her sisters abducted and she herself was raped. The fighting between white settlers and Aborigines had so intensified by 1830 that it became known as the "Black War". The colonial authorities decided that action had to be taken. They tasked George Augustus Robinson with locating the remaining Aborigines and convincing them to move to a nearby island. Truganini agreed to help Robinson, hoping that this would put an end to further killing of Aborigines. She believed the assurances that Aborigines would be safe and protected. Between 1830 and 1834 she and her partner Wooraddy traveled with Robinson on his "missions". She served not only as a guide, but as an interpreter as well. She even helped save Robinson's life a few times. Tragically, the new settlement on Flinders island turned out to be a prison and death trap. People were getting sick and dying from influenza and other diseases. Truganini began warning Aborigines against coming to the settlement, advising them to keep away. In 1847 she and 45 remaining Aboriginal survivors were moved to Oyster Cove. Conditions here were worse however, and by 1873 she was the only one still alive. In spite of this, she managed to find some peace and contentment because she was close to her tribal territory. In her later years, she lived in Hobart, in the care of a friend. She died in 1876 at the age of 64. She was buried on the premises of the old Female Factory in Hobart. It was not till 1976 however that her dying wish was granted - after her remains were cremated, her ashes were scattered on the waters of her traditional land. This special Tasmanian will always be remembered for her courage and strength in the face of harsh and brutal times.